Here is a set the mid. dist./dist. freestylers did Tuesday 12/18. We train at Wolf Ranch Rec. Center in Colorado Springs at 6400 feet so I have to give them more rest on certain sets and repeats. The focus on the 200’s was to get out strong and steady, the 50’s focus was the middle part of the race where you have to be more aggressive getting out of your comfort zone, and the 25’s focus was to bring it home with a great tempo and legs. Also on the 25’s I had a few kids do their specialty stroke like fly, breast, or backstroke focusing on their 100 goal pace. 5×200@2:40 pink +5×50@50 red +4×25 beat the beep with a tempo trainer. Regroup after beat the beep. Individuals have different times to beat. So 1 to 1.5 minutes rest before the 200’s. 4×200@2:40 pink +4×50@50 red +4×25 beat the beep with a tempo trainer. 3×200@2:40 pink +3×50@50 red +4×25 beat the beep. 2×200@2:40 pink +2×50@50 red +4×25 beat the beep. 1×200@2:40 pink +1×50@50 red +4×25 beat the beep. The idea behind holding 2x cycle count on the 1st 25 is to practice an extreme tempo. Taking double the normal number of strokes is actually pretty difficult! This set is intended to help breaststroke swimmers build and maintain their tempo during a race. We use Finis’ Tempo Trainer Pro. This set uses the Tempo Trainer Pro to help our swimmers swim at race pace for 200 yard events. 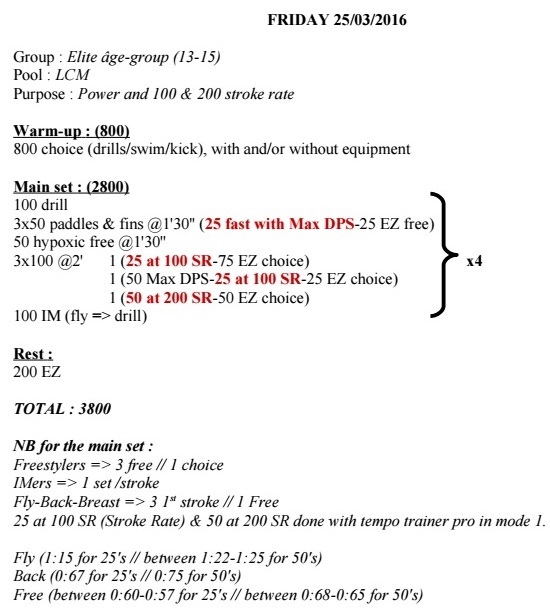 The beauty of using the Tempo Trainers is that the swimmers can focus on tempo, technique, etc. without having to listen for times. They simply listen for the beep and try to keep up with it. We set the Tempo Trainers for a swimmer’s average pace for a 25 in a 200 yard race. Use the pace cards to find your race pace. This means that the swimmer will hear a beep at the beginning and end of each lap swum at pace. 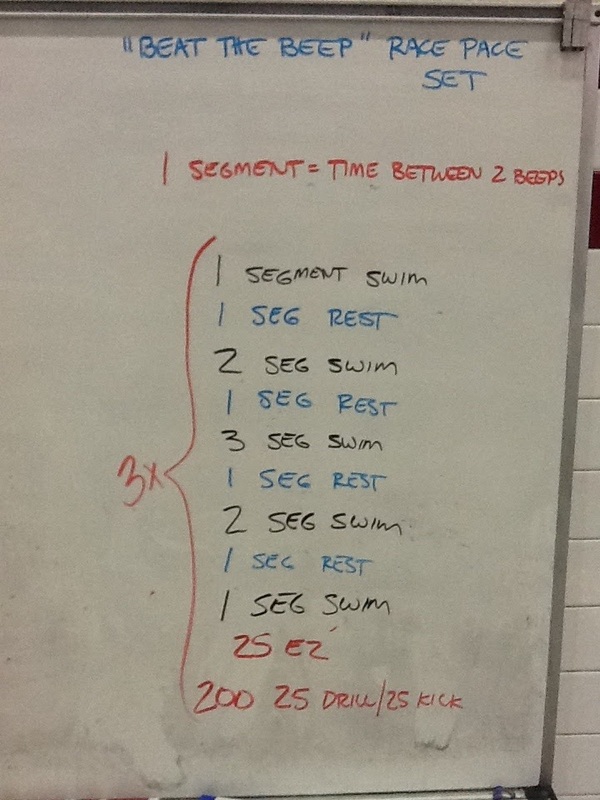 We call the time between beeps a “segment.” Thus for a swimmer whose best 200 time is 2:00, 1 segment equals either a 25 swim performed in :15 seconds or :15 seconds rest. This set can be done backstroke or freestyle, and is meant to challenge the athlete’s ability to hold tempo. Use a Tempo Trainer and be sure to establish your Threshold Tempo (TT) first. Perform multiple rounds if desired. After the set, use The Swimming Calculator and your Cycle Count to determine what a reasonable time goal you could achieve if you were able to sustain your tempo longer than you did on the above set. Try this set for a little tempo and technique work. Tempos should work well for free, back, or fly. The ability to swim fast while using little oxygen is a vital skill for sprinters. This set aims to improve that ability. For a little variety, do it with paddles and/or a buoy and fins. For a bigger challenge, do all max speed swims at your Threshold Tempo with a Tempo Trainer. Disclaimer: Use caution when performing hypoxic restricted breathing sets. Do not push yourself too far or you risk blacking out. Do not hyperventilate in preparation for a swim. Only perform this set under the direct supervision of a coach trained in rescue techniques. Spin drill is sitting up “like in a chair,” with head still, very aggressive kick, and arms spinning at maximum speed. Don’t worry about holding water with your hands or moving quickly through the water. The entire emphasis is on tempo here. In order to do this set, you should have already established your Threshold Tempo. This set will help you train your neuromuscular abilities while enhancing your overall aerobic fitness. For your “prime stroke,” choose whichever stroke you would like to work. I particularly recommend this workout for backstroke, freestyle, and butterfly. This set requires significant discipline on the part of the athlete to hold the tempo under fatigue. What we are trying to do here is push the neuromuscular border between success and failure to new faster levels. Thus, we will use the slowest failure tempo that we tried as your threshold tempo. More sets using the Tempo Trainer another time.